Good morning, everyone. The weather is very cold, isn't it? We have 40-day and 21-day participants here and all of you are working hard in the workshops. This year, compared with previous years, it is very cold. So, please take care. True Father, in Spirit World, is preparing for Foundation Day. How should he be to us after Foundation Day? True Father is thinking deeply about Foundation Day. All blessed family members, True Father wants us to work together with True Mother. True Mother wants to restore the nation and the race. It is the responsibility of blessed families to restore tribal messiahship, and to restore hometown. While True Mother is on earth, God's will must be settled on earth. There are 7 billion people on earth, but only less than 100,000 members on earth. This is very painful to True Father. On earth, even though True Father prepared many things, God's providence of restoration, after the fall of Adam and Eve, is to make the earth the Garden of Eden. The fact that True Father gave the blessing to a lesser number of people, is painful. True Father asked for Tong ban kyok pa (neighborhood witnessing), and True Father did many blessings. True Father counted on couples, and trusted us. But, in Spirit World, True Father saw such a small number, and felt so painful. True Father wants us to bring one person to the church, but we didn't do it. In 2013, the WA prize is to be given. But, not so many people have joined. I remember, when I first went to Spirit World; True Father and True Mother said to God, that we were filial sons/daughters. So, True Parents made many indemnity conditions to accomplish God's will. So, God's felt so appreciative. On earth, we don't know well about Original sin. We know it intellectually. But, how big it is, and how much damage it has done, we don't know well. Original sin, collective sin, inherited sin, individual sin, all due to Original sin. So, Satan and Evil Spirits are controlling us. This morning and last night we did chan yang session. The spirits in us are not good; they are evil, Evil Spirits. In chan yang session they can be removed. Yesterday, I had a consultation, and one member was very sincere in making conditions, etc. but still this person was doing everything under the direction of Evil Spirits. The Evil Spirits let this person think "I am an angel," but this was not an angel, but was disguised. It was an Evil Spirits. So, this person cannot be acknowledged to other people. Yesterday I got a letter and phoned to this person. He was on his way to Chung Pyung on a bus, and would arrive about 2 pm. I called him, and this person came. I consulted with this person, even though not in a 2-day workshop. When I saw the letter, I felt without a consultation, something may happen. I met and removed some Evil Spirits, but not the central spirits. So, I removed all the Evil Spirits, acting as angels. We may have some dream, etc. but we must check if it really is an Absolute Good Spirits or not. A spirit may tell you: don't sleep together with your spouse, etc. These are not principled. Such checking has to be done. This person did not check, so they were dominated by Evil Spirits. Because of sincere devotions, however, he could come on the bus and meet with me. We work together with sins and Evil Spirits. They are dominating us now. The best way to live well is to live by way of the Principle. When we do wrong, we have to think: is it Principled or not? If we dislike someone: is it Principled or not? When we hear things: is the Principled or not? Anything: is it Principled or not? Everything in our daily life: is it Principled or not? In Absolute Good Spirits Spirit World, we have to make a common base, and they can come to us. If we don't communicate well, we have to make a foundation and God's can give blessing. God's told me to make the foundation for the Cheon Cheong Gung by 2005. On Dec 28, we received permission from our county office. I brought success because I kept to five things: truth, sincerity, fact, love, etc. Since I worked like this, I expected some return, but I never expected such a big return. Day and night working so hard. Not thinking about personal benefit at all, but just giving based on true love. That is why Chung Pyung could develop and 440 billion Absolute Good Spirits could be made. But it was not easy. I had to find them, educate them, etc. Time in the Spirit World, in earthly time, is very long. To make 440 billion Absolute Good Spirits I made such amazing works. We who do not have Original sin (2nd, 3rd gen), we need to live a Principled life. In God's providence, the textbook to live well is the Principle, and True Parents' words. 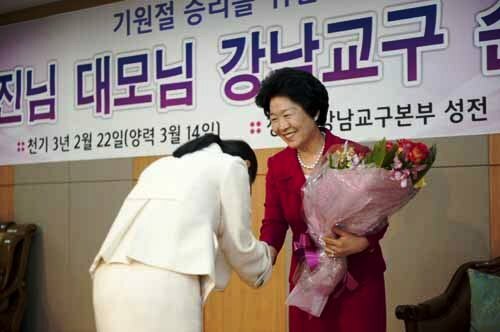 Our church now, this is the most difficult time since the beginning of the Unification Church. If you go on the internet, there are, i.e. legal things, etc. These are written based on their thinking. Some are attacking Dae Mo Nin herself. I never used public money. All the money will go to the accounting department. They record it, and take it to the bank. Who makes all the decisions? Vice President Ha does. Hoon Mo Nim is not deciding! So, how is Hoon Mo Nim misusing public money? When you see Chung Pyung staff members, you feel that they are lacking in many respects. But, I like them because they don't misuse public money. The workshop fee you pay is only for your expenses. None of it goes to staff salaries. The store makes money also. If these internet items are written based on truth, okay, but they are not written based on truth, so Satan knows. I hope all of you could watch the Korean historical dramas. I learned much after watching them. Often someone will kill someone, and now their descendants are not living well. There are things we should not do, and things we should do. There was one member, from whom I removed Evil Spirits, this member was guarding the door to a Palace. If a person gave money, they would let them in, but if not giving money, they were not let in. I asked the descendant if they have disabled ancestors. When I saw this, I felt that people will do well if they live Principled lives. We are planting seeds, if we live well, our descendant's will live well. If ancestors did wrong, the descendants will suffer. On earth, to go a standard of abs faith, we need to work hard. Then, our descendants will live well. I went to a prayer hall somewhere and returned, and there was a letter waiting for me. Many people have difficulties. Some problems can be solved by themselves, but aren't. Why? Because they are not living Principled lives, they are not living harmoniously, etc. In our daily lives, we need to live centering on God's/True Parents, and LSO. Then we can live. If my problems appear to my descendants, what will I do? To resolve difficult situations, we need to live centering on Principle. To help our tribes, we should not give them difficulties. Educate your tribes, educate your family members. There are some people waiting until their time of death to give their last will. "I will say such and such a thing at the time of my death." But then it is too late. You have to live well, and give family education, and then character education, and then school education. But we don't think about this. We are only thinking about school education. To raise kids well we have to live Principled lives. Even True Father said, yesterday, "I will hold a whip of love after Foundation Day." True Father will become the substantial body of God and will show living presence after Foundation Day. So, WA is not something "other," but we have to know what to do. In one letter, I read "my son is smoking and drinking," etc. If you give love with Principle then their personalities can be found. If you don't show sincere devotion, our children can't understand. Put your hand on your conscience and you can know your mistakes. How to resolve? By living according to Principle. Chan yang session is how you can live well. Without taking out Evil Spirits, you cannot live well. In your daily life, you are not living according to your own thinking, but according to the influence of Evil Spirits. Your clothing, your lifestyle, your manner is being influenced by Evil Spirits. Because of the influence of Evil Spirits, true love cannot come out. At the 18 anniversary of Chung Pyung works, come to Chung Pyung and offer sincere devotions. Your things you can feel centered on conscience, can be resolved. In the prayer hall, or at the tree of blessing, you think about things. You can think I lived such and such a way, etc. Please forgive my sins. We lived confusedly, we told lies, etc. but our responsibility was not followed. After Foundation Day, if we are not Principled, this is not right. Now, if we are heavy inside, these are the works of Satan and Evil Spirits, but if you are not Principled, you will not be able to live comfortably in the environment. You think, after Foundation Day, we can live well. But that is not right. In the era of CIG we have to live by Principle. Then we can receive blessing. To whom is blessing given? To those living by Principle. If you become better and better, you will be receiving blessing over time. Over time, love and Principle is more comfortable. We have lived by evil habits, but when you come to this side, centering on original mind, then more easily, you can live more comfortably. When the 18 anniversary comes, confess centering on conscience, then you can have a good result. To remove Evil Spirits, who made you believe bad things, please come to the 18 anniversary of Chung Pyung. Now the 18 anniversary is ready. Please come to the training center, and all things you reported centering on minds, can be resolved by Absolute Good Spirits and angels, and can be removed. Then life can be lived centering on blessing. Is this good or not? I am so happy. If we had before...things are coming when results will come with our prayer. The place where an Evil Spirits is separated (like a big tree root uprooted from the ground), this place needs to be filled. The era has come; everything will be accomplished according to our prayer. We met True Parents and our prayer will be effective. True Parents will do continuously. In the Second Generation workshop, 440 billion Absolute Good Spirits will come. One person wrote a long letter. They wanted fewer members to come so that more Absolute Good Spirits could be available to help them. I told them they were too greedy. Have a prayer that many people will come, and blessing may come to you. When the 2nd gen members, learn Principle and study well and practice well. You came for the absolute matching. The weather is cold, but please have the mind that the weather is warm. Thank you for coming. The Chung Pyung staff will work hard. We finished a 100 day condition at the tree of blessing. We will do our best. Please be healthy and happy, and become filial sons/daughters. I will close here. Thank you very much.